Mardi Gras fashion is a delight to the senses, but with all the preparation and planning going on, the smaller details can be missed. The shining sequences, the colorful plumes, the extravagant headdresses and the time it takes to design and make the clothes used by the krewes can be lost amongst the crowds, the throws and the booze. Whether it be a small walking parade or a giant super krewe, a lot of love and attention to detail is poured into what the participants of the Crescent City’s biggest show wear. 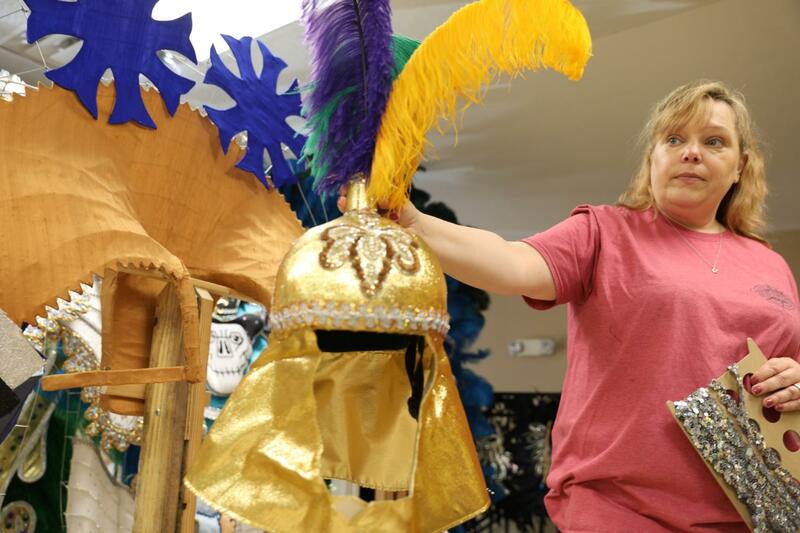 For 32 years, D & D Creations has been designing, sewing and creating headpieces, costumes and ball gowns for the carnival season right in the heart of Kenner, Louisiana. 49 weeks of work each year creates wears for more than 45 different krewes across the southern United States. Starting out of the family garage, D & D Creations grew into a 10,000-square-foot studio with 20 employees led by Missy Hildreth, who has taken a leadership role after her parents. Hildreth recounts how her father, a former Bell South employee, marched into the world of Mardi Gras fashion. “The way my parents learned was that they were a part of a Mardi Gras krewe that did their own costumes, and the captain of that krewe was an engineer by trade and taught my dad how to do the wire,” she said. The process of forming the wire to fit the shape of a headdress is complicated and timely, but it became the passion of Hildreth’s retired father. His work made D & D Creations known for their light-weight and sturdy headdresses. Hildreth said the business grew because of the extra support and comfort her father’s headdresses brought to pieces that could be almost 50 pounds. The studio is more than just a factory for headdresses. In the workspace buckets of sequins, fabrics and spindles line the walls, sewing machines are hard at work and a crew of designers and seamstresses creating costumes for the float riders and parade walkers. Everything is done in-house, from measurements, to fittings and designs. “That’s pretty much what we do. Everyday,” Hildreth said. As far as the costume-creation process goes, D & D Creations can be as personal and customizable as the krewe or the rider would like. The end goal is to create an article of clothing that the customer can feel attached to. “Somebody comes in here with a couple thousand dollar budget, we can do something. If someone comes in here and says, ‘I have no budget. I want to look amazing.’ We can do that too.” she said. Whether designing for clients as big as Bacchus and Excalibur to smaller parades in Texas and northern Louisiana, Hildreth stresses the fact that every costume is made to look its best. Former king of Thoth, Tim Melancon, enjoys how personal the creation process can be. Hildreth and her staff create the wears of the court of Thoth: the ball gowns and costumes of king, queen and officers. Melancon is impressed year after year with the personal attention that the staff brings to each creation. Brent Boyd also feels the same satisfaction as he is looking forward to his third costume by Hildreth for the Zulu Tramps. For Boyd, there is no feeling like seeing the finished product after the long creation process. Once everything is glued, stapled and sewn on, Hildreth wishes that more attention and appreciation be given to the costumes, headpieces and other garments. Despite the hard work and long hours, Hildreth said she still enjoys her craft.